If you are searching for an ultra-portable, handbag-sized Hair Straightener then the 'Carmen C81015 Cordless Rechargeable Mini Hair Straightener' is perfect for those on the go hair styling requirements. 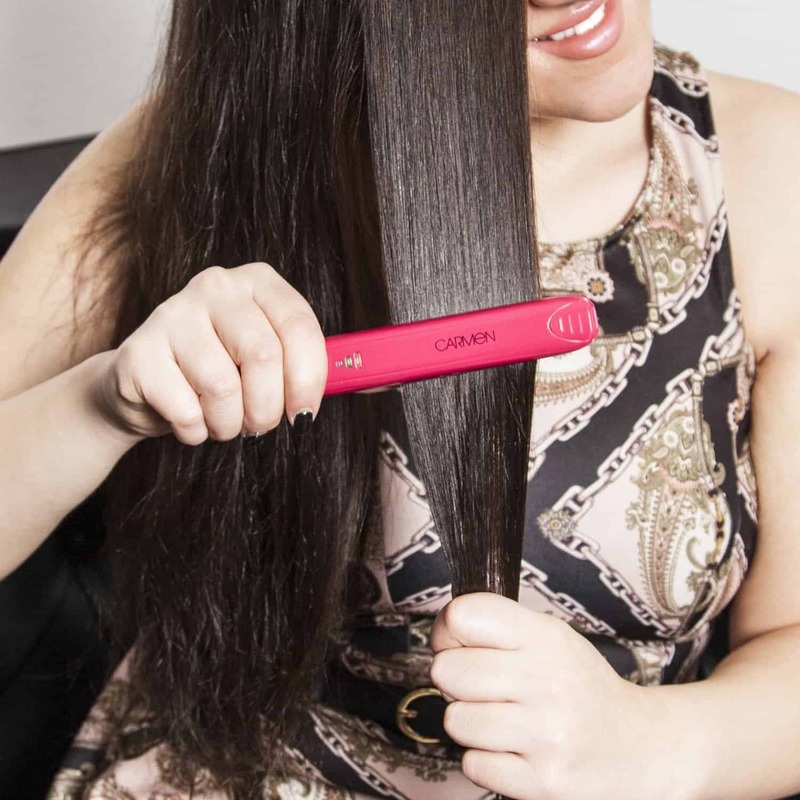 This cordless mini hair straightener is a perfectly designed portable device used for creating curls, straightening, and just for simple taming those frizzy locks instantly to suit your style. The built-in narrow plates are perfect for day-to-day hair styling, particularly on shorter hair and fringes. This will let you smooth out waves, undesirable curls, and cowlicks. It’s also great for adding flicks and movement to your hair to create your perfect hair style. The material used in plates of this straightener is ceramic. By the use of ceramic technology, heat gets maintained uniformly throughout the surface area. This makes sure that there isn't any hot spot, which helps in maintaining the smooth flow in hairs. Hair straighteners are amongst the most commonly used techniques to accomplish a modern-day and elegant search, and various practices have already been attempted. One of the best methods to achieve that appearance is by utilizing 'Carmen C81015 Cordless Rechargeable Mini Hair Straightener. They are a mix of ceramic hair correcting irons and ionic tourmaline innovation that make usage of infra-red heat. The Carmen mini is designed with a high end material that we all trust – ceramic!﻿﻿ Use of ceramic material prevents any possible pulling or snagging. This pulling and snagging of hairs are the main reason for damaged hair follicles whilst styling your hair. This keeps your hair protected and healthy along with creating silky smooth and shiny hair. It usually takes around 60 seconds for the straighteners to heat up, which is great when you’re on the go and want to quickly style your hair or a quick touch up, so when you’re at those festivals camping no need to worry about spending too much time styling your hair it will be over in flash, perfect! 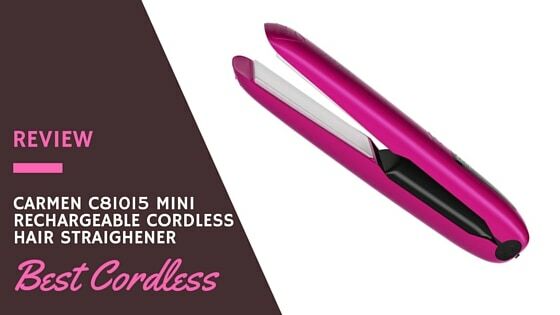 This hair straightener is great to use where there is no plug socket around. It comes with a rechargeable lithium battery. This is the main feature, which defines its portable and cordless nature. To achieve continuous usage of almost 25 minutes, it takes less than 3 hours to charge. A handy feature integrated within this straightener is that it can be used whilst recharging, no need to sit around waiting for it charge. 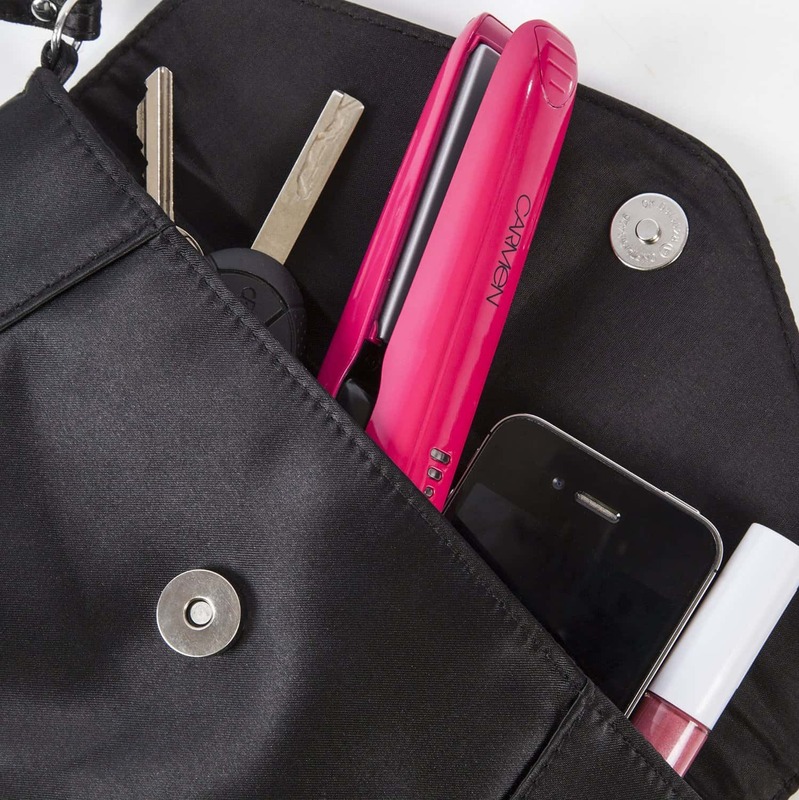 The compact and lightweight design enables the straightener to easily fit into your suitcase/handbag. Hence, providing the hair styling wherever you are camping, travelling and whenever you may need to use this product. 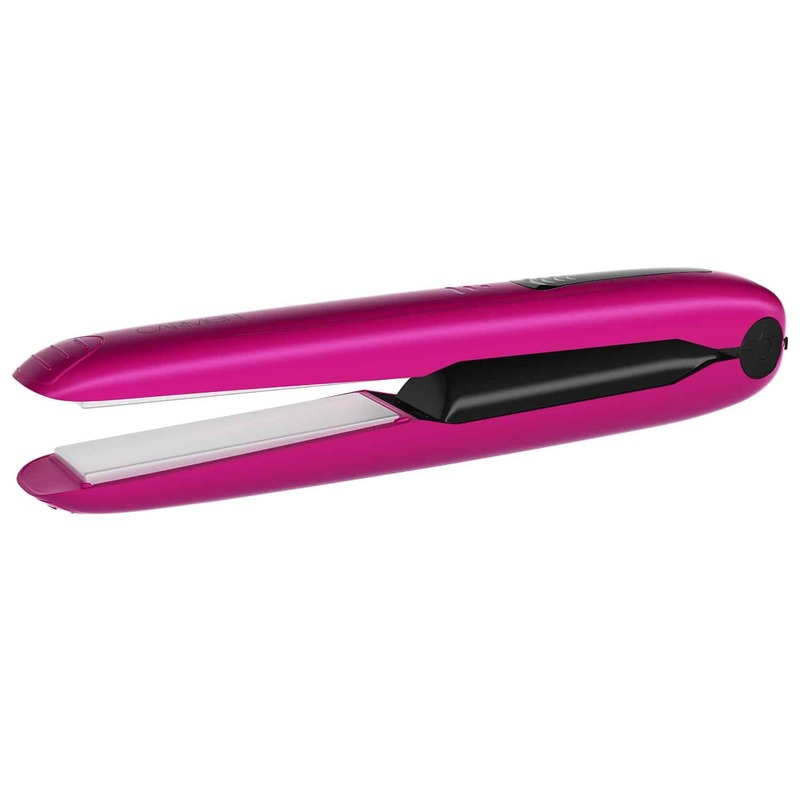 It comes with an auto-lock system, which enables the straighteners to keep a secure manner. This also reduces damage to the straighteners and also comes with storage space to carry around with you which is needed when travelling. The straightener also comes with travel heat resistance pouch; this heat resistance pouch helps in securing the other items from being damaged in your bag or burning anything when putting your straightener down on any surface. 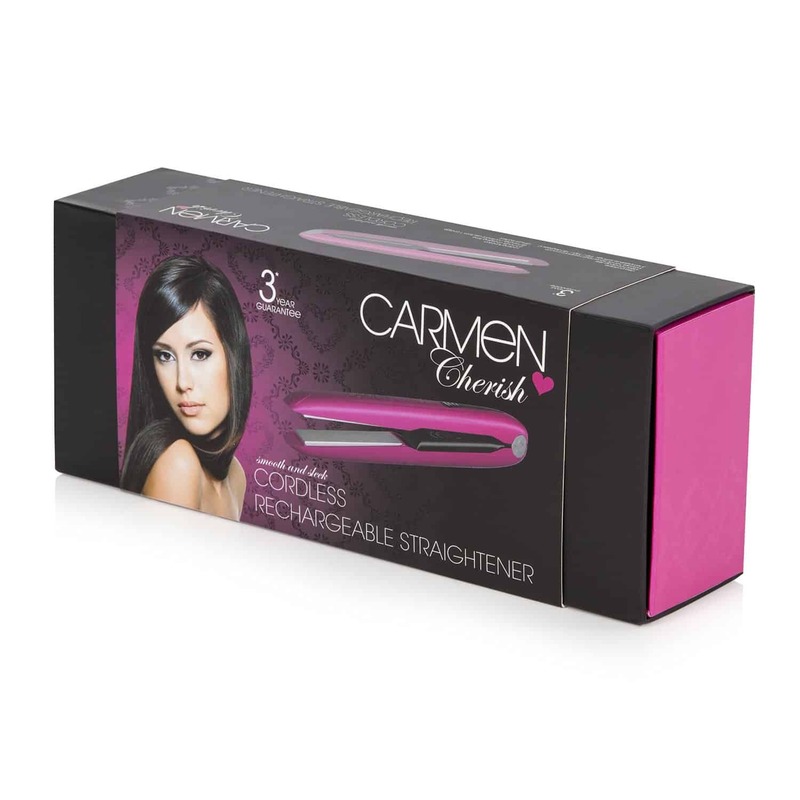 The Carmen cordless mini hair straightener comes with one of the top most powerful heating system. You can easily select between three different heat settings that are available (140/160/180). The temperatures offered, range between 140F to 180F, you can select the desired heat setting as per your hair type. It’s an important feature for a straightener to hold, for those individual hair types depending on what heat you personally need to use to make sure you achieve your desired look but don’t damage your hair follicles. This straightener is top of line with all the necessary features included for a great price, currently on amazon this product is £50.30 this is higher than average for the mini travel straighteners we believe this is because they have made this a unique pair that offers just that little extra. The 'Carmen C81015 Cordless Rechargeable Mini Hair Straightener' is the ideal solution for all kind of hair styling needs on the go. It is easy to use, compact and best for travel features will leave you completely satisfied. It will be saving your time while styling your hair wherever you may need to use them. For styling your hair in a professional manner, this straightener could be the one you want.